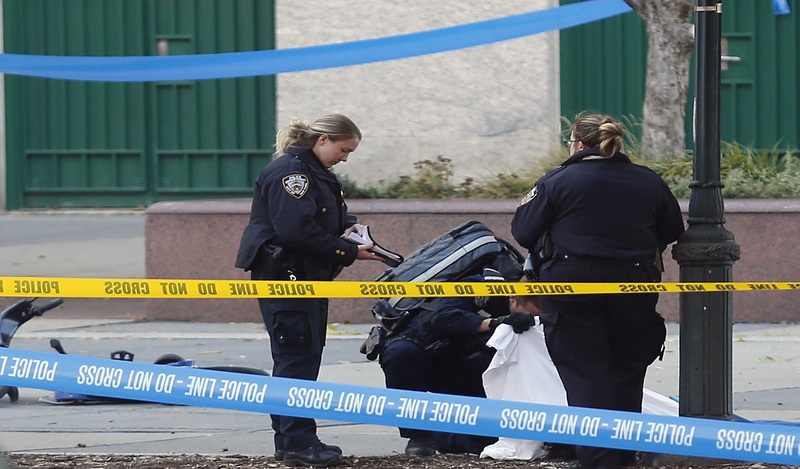 Law enforcement personnel examine the scene Wednesday, Nov. 1, 2017, after a driver mowed down people on a riverfront bike path near the World Trade Center on Tuesday in New York. The Uzbek immigrant accused of using a truck to mow people down along a bike path, killing eight, "did this in the name of ISIS" and followed the extremist group's online instructions practically to the letter, police said Wednesday. 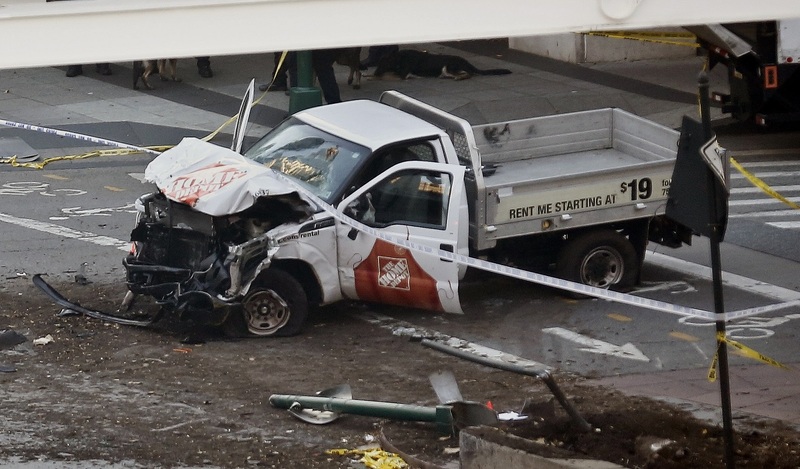 Investigators, meanwhile, were at the hospital bedside of 29-year-old Sayfullo Saipov, working to extract information about the attack Tuesday near the World Trade Center memorial that also left 12 people injured. Saipov was shot by a police officer after jumping from his rented Home Depot pickup truck. John Miller, deputy police commissioner for intelligence, said Saipov left behind notes at the scene, handwritten in Arabic with symbols and words, that essentially said the Islamic State group, or ISIS, "would endure forever." "It appears that Mr. Saipov had been planning this for a number of weeks. He did this in the name of ISIS," Miller said, citing the notes. "He appears to have followed, almost exactly to a T, the instructions that ISIS has put out in its social media channels before with instructions to its followers on how to carry out such an attack," Miller said. In Tuesday's attack, Saipov drove his speeding truck for nearly a mile along the bike path, running down cyclists and pedestrians, then crashed into a school bus, authorities said. He was shot in the abdomen after he jumped out of the vehicle brandishing air guns and yelling "God is great!" in Arabic, they said. Mayor Bill de Blasio called it "a cowardly act of terror." The aftermath took a political turn Wednesday when President Donald Trump said Saipov came to the U.S. under a visa lottery program — "a Chuck Schumer beauty," Trump called it in a reference to the Senate's top Democrat. The program dates to 1990, when Republican President George H.W. Bush signed it as part of a bipartisan immigration bill. Trump urged tougher immigration measures based instead on merit and said he will ask Congress to end the program. In a number of recent extremist attacks around the world, the assailants were found to have been "lone wolves" — inspired but not actually directed by the Islamic State. In some cases they never even made contact with the group. Gov. Andrew Cuomo said Saipov became "radicalized domestically." "We will not be cowed. We will not be thrown off by anything," de Blasio said. 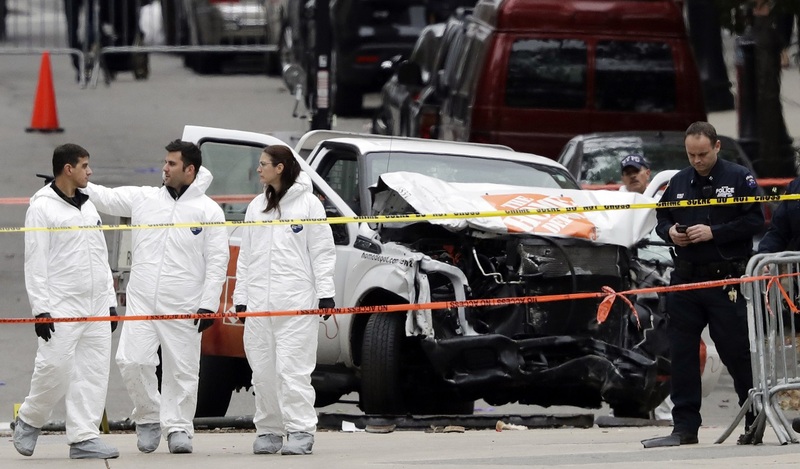 While the mayor said there have been no credible threats of any additional attacks, police announced the deployment of sniper teams, bomb-sniffing dogs, helicopters, sand-truck barricades and other stepped-up security along the marathon route, in the subways and other sites. And New York Police Commissioner James O'Neill urged people to be vigilant and tell police if they see "something that doesn't look right." The slight, bearded Saipov is from heavily Muslim Uzbekistan and came to the U.S. legally in 2010, police said. He has a Florida driver's license but was apparently living in New Jersey, they said. He is a permanent legal U.S. resident. A law enforcement official said he has two children and a wife and moved up from Florida around June. The official wasn't authorized to discuss details of the investigation and spoke on condition of anonymity.